Fancy a cuppa? 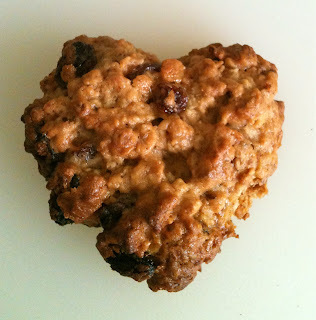 My Oat and Fruit cookies may be lovely company with a cup of tea. One of the cookies turned out a heart shape... awwww. Put the brown sugar, caster sugar and butter into a mixing bowl and whisk them together until it has become smooth. Add all the rest of the ingredients into the bowl with the butter and sugar mixture. Mix everything together so that it is all evenly distributed. Then shape it into a ball with your hands. Lightly flour your work surface and then roll out the ball of cookie dough to a thickness of about 4mm. Put the cookies into the 170°c oven and bake them for 15 minutes. When they are cooked, remove them from the oven and leave them to cool on the baking tray for 3 minutes or so before putting them on a wire rack and allow them to cool to room temperature. We have been having really rainy summer this year in Britain. Where has summer gone? First, I baked a batch of flapjack (click for the recipe) with walnuts and prunes. While the flapjack was baking in the oven, I prepared the muffins. I really love fresh blueberry muffins, but here are "Summer Forest Berry Muffins" which are inspired by my favourite English Summer Pudding, which includes several kinds of berries. Yes, you can see lots of berries in the muffins. I used frozen mixed berries, raspberries, blackberries, blueberries, redcurrants and blackcurrants. It's quite handy keeping a bag of frozen mixed berries in the freezer as you can get almost the same lovely juicy flavour as fresh berries.... and you can bake whenever you feel like it without rushing to the supermarket. The only thing you have to remember using frozen berries is NOT to defrost the berries before mixing the batter. Put the frozen berries straight from the freezer into the dry mixture, them add the wet mixture as usual. As I love berries I put about 170g of berries in this mixture... and they were delicious!! But you may not need that much. 125-150g of frozen berries would be just lovely! Measure milk and oil in a large measuring jug. Add egg, lemon juice and vanilla, then whisk well.